^ "About Chimamanda". 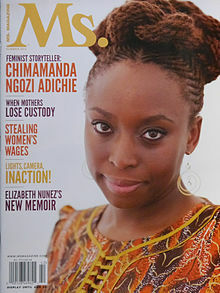 Chimamanda Ngozi Adichie Official Author Website. Retrieved 2018-05-24. ^ Enright, Michael (December 30, 2018) . The Sunday Edition - December 30, 2018 (Radio interview). CBC. Event occurs at 52:00. ^ Pilling David (June 30, 2016). "Lunch with the FT: Chimamanda Ngozi Adichie". Financial Times. Retrieved July 5, 2018. ^ MacFarquhar, Larissa (June 4, 2018). "Chimamanda Ngozi Adichie Comes to Terms with Global Fame". The New Yorker. Retrieved July 5, 2018. ^ Hewett, Heather (2004). Adichie, Chimamanda Ngozi, ed. "Finding Her Voice". The Women's Review of Books. 21 (10/11): 9–10. doi:10.2307/3880367. JSTOR 3880367. ^ "Chimamanda Ngozi Adichie wins PEN Pinter Prize". The Irish Times. June 12, 2018. Retrieved June 12, 2018.